Sarah Ahmed is an independent, London-based wine writer, educator and judge with a particular interest in the wines of Portugal and Australia. Sarah was awarded the Vintners Cup in 2003, the Portuguese Annual Wine Awards’ Wine Writer of the Year 2009 and was short-listed for the International Wine & Spirit Competition Communicator of the Year in 2009 and 2010. In addition to publishing www.thewinedetective.co.uk she writes for several respected magazine titles including Decanter and The World of Fine Wine. Since 2006, she has contributed on Portugal, Port and Madeira to Hugh Johnson’s Pocket Wine Book. Sarah consulted on Portugal and Australia for the seventh edition of The World Atlas of Wine by Hugh Johnson and Jancis Robinson MW and has contributed on Portugal for the upcoming 4th edition of Jancis Robinson MW’s The Oxford Companion to Wine. 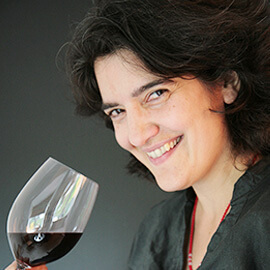 Counted among Decanter’s “experts par excellence,” she is Regional Chair for Portugal at Decanter World Wine Awards, the world’s largest and most prestigious wine competition. In 2013, she was admitted to the rank of Cavaleiro of the Confraria do Vinho do Porto for her commitment and contribution to Port wine. It’s no secret that most Portuguese wine regions are still unknown for most people. They are even quite unknown for people working in the wine industry. “Pormenor” means “detail” in English. Evidently, Pedro Coelho has indeed paid attention to the detail and done his homework. I live in a city. I grew up in the countryside but couldn’t see myself living anywhere else than the concrete embrace of my city. I was bowled over by Monte da Ravasqueira’s latest releases, especially Monte da Ravasqueira Premium White 2012, Premium Rosé 2013 and Vinha das Romãs 2012. “What do you eat in Finland?” That’s a question I hear a lot. In 2000, Lisbon-based IT entrepreneur Abílio Tavares da Silva started looking for a vineyard. He was always dead set on the Douro. But he was fussy. I like to travel. Who doesn’t, right? But I don’t like flying and I think spending time at airports is inhuman. Yet it’s something we have to endure. Never before has poker shared a thought bubble with Port. Not in my head anyway. Yes. It’s that time of the year again. Like every year on 21st of July at noon the crayfishing season starts. And like every year I’m both excited and just a tiny bit scared. Blend is a brilliant name for a Portuguese wine magazine. Why? Because the Portuguese are the masters of blending – whether it’s different grape varieties or vintages.